Franz Liszt, born in Raiding, Hungary in 1811, was a famous Hungarian pianist and composer. Known as the King of Piano, he was one of the most prominent representatives of romantic music. 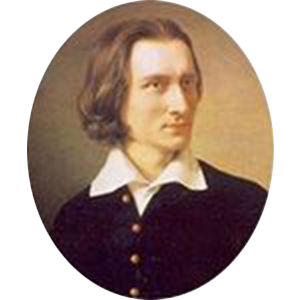 To commemorate the two-hundredth birthday of Franz Liszt, Hungary decided to name 2011 as “The Year of Liszt”. The Ministry of Culture of France also called 2011 “The Year of Liszt” to pay their reverence to this great musician since Liszt once lived in France. Meanwhile, varieties of similar memorial activities are also held all over the world. In response to the global large-scale Commemorative Liszt activities, I.M.A. (Hong Kong International Musician Association) held the 2011"Liszt Award" Hong Kong International Piano Open Competition. Jury members were from different countries and areas. During the competition, a series of theme concerts, analytical lectures about Franz Liszt's works, and master classes were also held. The competition has achieved an unprecedented success and won a good reputation and influence in the field of the international classical music. From now on, the "Liszt Award" Hong Kong International Piano Open Competition will in HK Held once every two years. The IMA.HK is a professional music group focusing on international art communication, which has been identified as high artistic level. The IMA.HK aims to offer an international stage for all musicians to communicate and develop further through holding concerts, masterclasses, forums, lectures, and competitions at regular intervals and expanding HK musicians. Hong Kong, a city where Chinese culture meets with Western culture and a place appealing countless talents, is the most active area of Asian cultural and artistic activities and an ideal land for global artists. IMA.HK, short for Hong Kong International Musician Association, is a proud memb e r of A l i n k- A rg e r i c h F o u n d a t i o n . T h e mu s i c p rof e s s i o n a l i sm a n d international influence of IMA.hk , including its competitions, have been recognized internationally. For years,IMA.hk has been working on expanding the influence of Hong Kong cultural brand, promoting Hong Kong international image, as well as providing an international platform for musicians around the world to communicate and develop themselves. A well-known British pianist, Steinway artist. Provide for global music enthusiasts with authoritative, international and professional music art competitions, concerts, special music lectures, great master classes and latest information. Music learners from different countries and places can communicate with the world top-level musicians online. Top-level musicians resource sharing, rich and varied online classes, and global well-knowned authoritative masters. Build up the record of individual exclusive music growth. Copyright @ 2017 Hong Kong International Musician Association. All Rights Reserved.